Google's email service Gmail is highly popular. 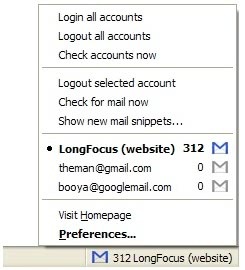 One of the restrictions that many users face is that it only allows you to sign in to one account at a time using the web interface.While you can use a desktop client to sign in to multiple Gmail accounts at the same time, it is not always possible or desired to use a desktop program for that. The single-account at a time restriction can be problematic for Gmail users who access more than one account regularly. This is for example the case in companies that use more than one Gmail email account. It is possible to use a desktop email client to retrieve all Gmail account messages at once. We recently reviewed a Greasemonkey script that allows you to manage multiple Gmail accounts in a web browser as well. The Firefox add-on Gmail Manager is another possibility. It is a highly popular add-on that enables you to manage multiple Gmail accounts in the browser. It places an icon on the Firefox status bar that provides quick access to all registered Gmail accounts.Besides that, it is listing all supported accounts including the unread email count of each account, and options to compose a new email message using one of the accounts. The context menu displays additional options that allow you to log out of an account, log in to all configured accounts, or check accounts for new messages. Notifications can be configured to inform you whenever new emails are available in one of the accounts, and tooltips are provided that display additional information and mail previews. Gmail Manager supports Gmail hosted accounts and provides one click access to any Gmail account that has been added to the Firefox add-on. The Firefox extension is an excellent companion for Firefox users who operate multiple Gmail accounts. Update: The extension has not been updated since 2011 and does not work anymore as a consequence. I suggest you use X-notifier as an alternative. The extension supports multiple Gmail accounts as well and acts as a notifier for those accounts. As an added benefit, it is supporting other email services including Yahoo's and Microsoft's as well, so that you can add them to the configuration to receive new mail information. I have been using this for more than a year to manage my 3 gmail accounts. It is updated regularly, and always works well. I have it log in to my accounts automatically, and I get a pop-up whenever any of my accounts gets a new email. It works well combined with Google Account Multi-Login, which is a GreaseMonkey script that somehow juggles your cookies and lets you stay logged in to multiple gmail accounts simultaneously. It also replaces the “log out” link with a drop-down box that lets you change accounts easily. With this, I can keep my work email open while adding events to my personal Google Calendar. It’s fantastic! Just a heads up, I’ve noticed this addon has trouble with Google Offline (Gears) as it always shows 0 new emails. There are others on their support forum with the same issue. Otherwise, it’s great and highly recommended. i know it’s not an option for some, and for others they’d rather access email via the browser, but personally, i’d say this is another reason for setting up POP3/IMAP access in an email client like Thunderbird. i also like the fact that my Google account isn’t logged in at all times because i’m using the web interface. You can also do this by simulating multiple sessions using multiple profiles. i cannot access my email account. I can access it on my phone i.e gmail mobile. what should i do to solve this? What became of my G-mail account? Everything just disappeared and someone is trying to make me use IE as a browser and I don’t want to. I like Google!!!!!!!!!!!!!!!!!!! There’s no better e-mail server, GMAIL is the best, try it. your site was originally blocked when unknowinghly I applied for a gmail account. now that is has been unblocked it will not give me the access to the email address i wish to use stating that it is no longer available. why not? I doubht that someone would have asked for the same name within the space of 10 minutes. is the above email working or not? please confirm to that email and alternative email. by the way hello friends how are you??? does anyone know what the hell is wrong with gmail account? i cant log in!!!!!!!!!!!!!!!!!!!!!!!!!!!!!!! please help!!! page cannot be found! let me c what u hv got meat.